This week was, again, a good week. In fact, quite exciting in many areas. Nursing continues forward without difficulty. I forgot to mention something a couple of weeks ago. One day, McKenna was eating and slowly bit down on me. I have had suspicion of teething pains in her for quite some time, and the biting down while nursing thing reinforces that suspicion. I firmly (not angrily) told her, “McKenna, you do not bite Mommy. That hurts.” She never did it again. I don’t really think she understood me word for word, but I do think she got the message. I am not, however, naive enough to believe that will be the last time she ever tries it. Time will tell. We are still using gas drops following every feeding. I don’t always remember to give it to her at the dreamfeed, but I usually do. One day, we ran out of gas drops, so I thought it was a good opportunity to see how she did. She started off okay, but as the day went on, she stopped sleeping well and was obviously in pain. I had my husband stop and get some on his way home from work. She was soon back to her old self. Waketime length stayed the same with the exception of her last waketime of the day. I will discuss that below. DROPPING NAPSMcKenna continued her weaning process from the fourth nap. This week, most days she did not take the fourth nap. She stays awake quite well the entire time (that is the longer waketime). As this week started, McKenna had been waking up close to 7 AM for several days. I decided I thought she could make it to 7 AM to eat. One day she woke at 6:30. I went in to her, gave her a pacifier, and rocked her. She dozed off and I held her until 7 when I put her in her crib. She promptly woke up and I started her day. McKenna continued eating rice cereal this week. Halfway through the week, I had her eat it twice a day. At the end of the week, I introduced her to sweet potatoes. I started with one tablespoon. She made all the usual funny faces the first day, but liked it the next. Right now, I feed her rice at her second feeding. I then feed her the sweet potatoes after either her third or fourth feeding. 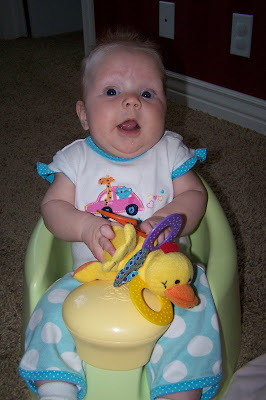 When I first started feeding her solids, she would constantly try to put her hands in her mouth. I would just move the hand away from her mouth and tell her, “No hands in your mouth while you are eating.” She no longer tries to put her hands in her mouth. Over the course of the week, she has gotten much faster at falling asleep with one arm out of the swaddle. I now keep one arm out for all naps and night. One morning, I woke up at 5:45 (okay, I actually wake up about that time every morning, then I have a hard time falling back asleep) and of course looked at her on the video monitor. She was awake and had both arms out of her swaddle. I was sure she would be crying soon. But she went back to sleep. Another night, she did the same thing but cried. She is about too big for her swaddle blanket. I am trying to decide if I should buy one in the next size, or if I should just decide that is a good reason for her to no longer be swaddled at all. The last night of this week, she woke me up at 5:30. I was surprised since she was consistently sleeping until at least 7. I looked at the video monitor and saw she was on her tummy. Oh great! If that continues, it will be the number one reason to stop swaddling cold turkey. Luckily we do tummy time each day and she has very strong neck muscles 🙂 I just don’t want her on her tummy without the use of both arms. We will see what the week brings us. Hopefully it was a fluke (although as I have watched her play on the floor, I could see she was getting close to this ability). I thought I should point out that McKenna does have independent play each day. She plays happily for 20 minutes every day. I also try to get in another 20 minute session at another time of the day, which she does happily, but we aren’t always able to get it in. I will start at 7:15 AM since that is the average. The week started at 7:00 AM. As the week went on, it moved later and later in the morning. Next Post Poll Results: When you stopped swaddling baby, was there a period of crying/fussing (no matter the length of time)? My 4 month old has been sleeping 11hrs a night. Her last feeding is at 7:30pm but she falls asleep around 8:45-9pm, waking up at 8am. I have tried to put her down earlier in the evening, as early as 7:30-8pm (adjusting her feeding time), but she doesn't seem to fall asleep before 8:45/9pm every night. What can I do to get her to sleep at an earlier time? Am I reading this right that McKenna sleeps 18 hours/day? Are all of her naps 2 hours long? I'm just trying to get a comparison. My son is not a great napper; his limit seems to be four hours cumulative (usually more like three) during the day but then he sleeps 12 hours at night (7pm-7am) without getting up to eat. I've never done a dream feed – just kept feeding him at 6:45pm and he gradually lengthened his night sleep on his own. ym, just keep trying to put her to bed earlier. But 11 hours is an acceptable length. Anywhere from 10-12 hours is fine. JenD, right now, she is asleep for about 17.5 hours a day. So long as your son is happy and alert, then whatever he is sleeping is working 🙂 I think McKenna might sleep more than the average child? hello there…i don't know if you get these comments anymore…but i am at my wits end!i have been doing babywise (with a few expections) since about 6 weeks…she has had a hard time with the 45 min intruder since birth, but it seems to be getting better, some weeks/days are better than others but for the most part she can put herself back to sleep…she has recently learned to roll over and we practice a lot during the day but it seems as though when that 45 min mark comes she gets restless and then invariably flips over and refuses to flip back over…i do the "put the pacifier back in once rule…and then let her cry it out, does ts phase-end?!?!? it is driving me nuts…the second thing is she has started this thing where she wakes up around 6 and rolls over and wont go back to sleep, but i know she is still tired and not hungry because when it is time to start the day she isn't extremely hungry and sometimes falls back asleep on me while nursing…the third thing…her bed time is around 8:30-8:45ish…is that too late?! sometimes she wakes up at 9:20-10:30-11 ready for play…i try and get her to go back to sleep, but around 10:30 i will feed her…but recently she has stayed awake… it is driving me nuts and i feel like i have started back at ground zero…i have read every post you have it seems but not for my exact issue…she is on a 3.5 to 4 hour schedule and i feed her right before bed to get the 5th feeding in…help!!!!!! Hello, our baby is 21 weeks old and only breastfeeding. She feeds about every 3 hours during the day. Lately, she has been waking up at 4:30 AM wanting to feed and then falls back asleep. Her start time of the day is at 7AM and she is then not interested in eating because she ate at 4:30AM. Is there any tips or tricks to fix this? Also, how long did your little one nap at week 21?